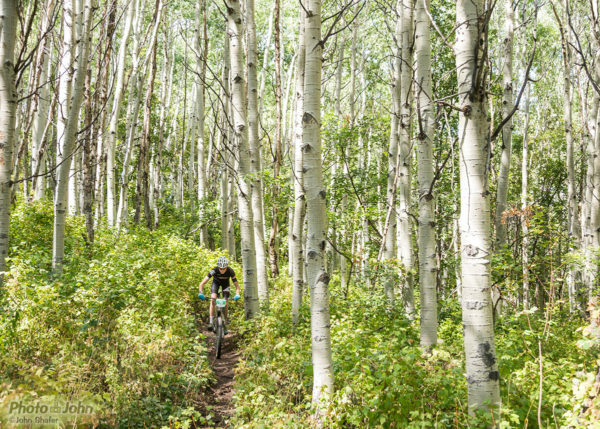 One of the things that sets the Park City Point to Point mountain bike race apart is the nearly 75 miles of twisty singletrack through endless aspen groves. I had the pleasure of shooting action photos of all the competitors in this year’s Park City Point 2 Point mountain bike race, a 75 mile endurance race with about 12,000 feet of climbing. 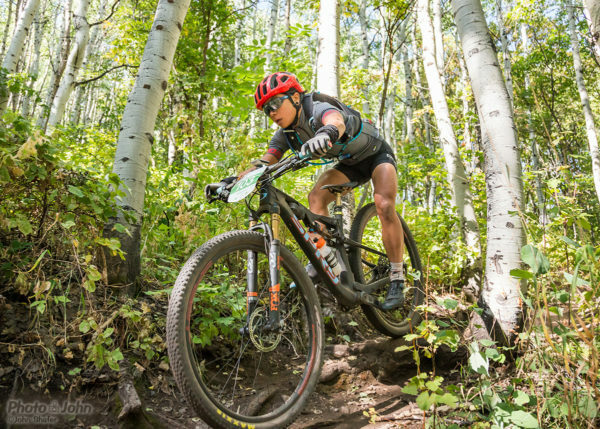 It’s one of the premiere mountain bike endurance races in North America – especially since over 90% of the race is on Park City’s world-famous singletrack. The 2018 Park City Point 2 Point was also the 10th anniversary of the event, making it even more prestigious than usual. Scroll down to see the 2018 Park City Point 2 Point photo gallery, browse all the race photos and order prints. The 2018 Park City Point 2 Point women’s second place finisher, Evelyn Dong, in the tight aspens on John’s Trail. Shooting an event like the Park City Point 2 Point is difficult – especially if you want to get photos of all the athletes. The easiest thing to do is pick a spot with consistent light that’s easy to get to. But that’s not what I did – of course not. I ride Park City all the time and I wanted a location that represents the trails well and that had good action for fun photos. The spot I picked meant I had to ride in (thanks for the shuttle, Greg and Dorothy) with a 20 pound camera pack. I think it was worth it, though. See for yourself – the photos are all below. There are nearly 400 of them and I managed to get photos of nearly all the racers. If you raced, there’s probably a photo or two of you in the gallery, below. Click on the photos to see them larger and visit my online store to order prints. If you’re an event promoter who needs high-quality, exciting photos of a race or some other kind of outdoor activity, let’s talk about how I can help support and grow your event.